The proposed mixed-use tower at South Broad and Washington streets would feature approximately 1,000 apartments, retail space, an above-ground parking garage and a rooftop "village" with boutiques and restaurants. A few weeks ago, developer and Tower Investments CEO Bart Blatstein filed for a zoning variance with the Department of Licenses & Inspections to move forward with a massive mixed-used project at the intersection of Broad and Washington streets, a site the city views as a gateway between Center City and South Philadelphia. 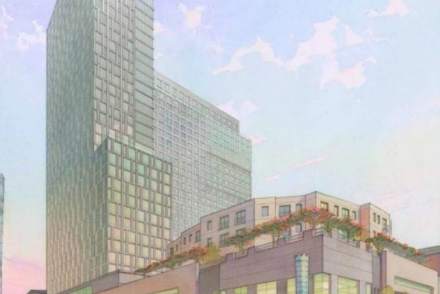 At that point, though Blatstein had revised the plan to address community concerns, renderings of the project still featured two apartment towers. Based on a report published Wednesday by the City Planning Commission's Civic Design Review board, the proposal will now feature one 34-story tower on a 4.4-acre site, including retail space and a smaller residential building accessed via an entrance along South 13th Street. Also included in the proposal is a fourth-floor rooftop "Village" for retail boutiques and dining establishments, designed to be reminiscent of a vista in France's Aix-en-Provence. In total, between the luxury high-rise and the adjoined residential building, the project calls for approximately 1,000 apartments. There will also be office space available for small businesses and co-working residents. Proposed tower at Broad and Washington. Pending zoning issues for the project include variances for the proposed above-ground parking garage, situated on a 50-foot-high podium, and rooftop decks for non-residential use. 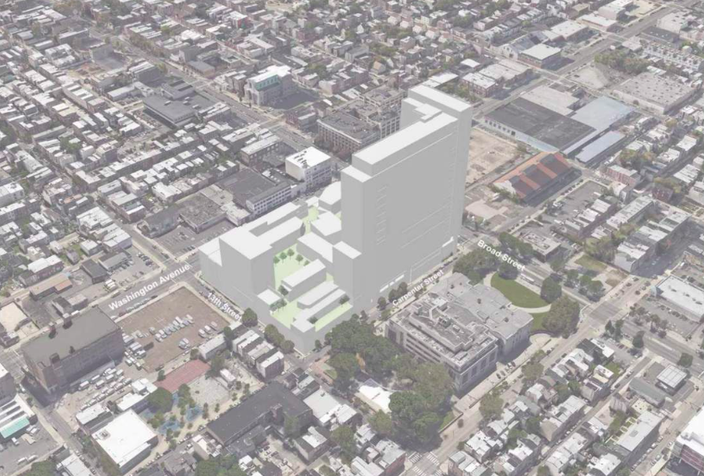 According to Plan Philly, Blatstein will still have to overcome objections from the Hawthorne Empowerment Coalition, which continues to hold reservations about the height of the 371-foot tower. Earlier this week, Inga Saffron of the Philadelphia Inquirer critiqued Blatstein's proposal as an outdated play for millennials in South Philadelphia, one that risks becoming a "dorm for adults." Saffron pointed to Blatstein's work at the Piazza in Northern Liberties as an example of a vision of his that worked, but said he now seems to be moving in the opposite direction of developers behind projects like East Market and the Science Center. In addition to the South Broad project, Blatstein recently partnered with Cescaphe Event Group to pursue a conversion of the former PECO Delaware Station in Fishtown into a hotel and event space. That site once had been the proposed location for the Foxwoods casino project that never materialized. The Broad and Washington project will go before the Civic Design Review board March 1.